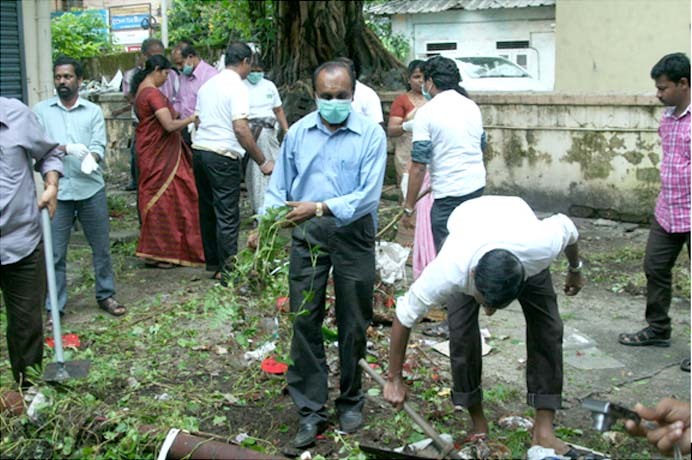 As per the Instructions of the Central Government, the Officers and staff members of Coir Board started a Campaign for making the Office premises and nearby places clean and tidy w.e.f. 25.09.2014. This is a part of the ‘Swachh Bharat Mission’ to be launched by the Hon�ble Prime Minister of India on 2nd October, 2014 spanning to 2nd October, 2019. To coincide with the National level launching of the ‘Swachh Bharat Mission’, the Officers and staff Members of the Board will be taking a ‘Swachhata Shapath’ at 9.45 a.m tomorrow (2nd October, 2014) at the Head Office as well as various Sub Offices of the Board spread over different States of the Country. In connection with this ‘Swachhata Shapath’ taking ceremony, the Board has arranged a speech on Gandhian Thoughts relevant to the context by Adv. V.M.Michael, Secretary, Gandhi Peace Foundation, Kochi. Officers and staff Members of Coir Board at cleaning work in the premises of Office as part of “SWACHH BHARAT MISSION” being launched by the Central Government.